Police in Plant City have an arrest warrant out for the driver of an SUV that hit three pedestrians, killing one and left the scene of the crash in early December. 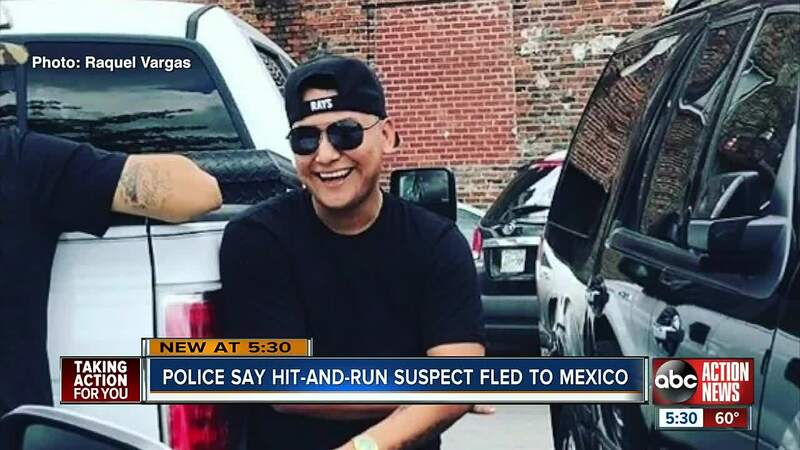 Miquel A. Hernandez, Jr., 21, of Plant City and two other men from Dover, ages 21 and 20, were walking eastbound on SR 574 after they left Fuego Bar and Grille and were struck by a vehicle traveling eastbound on SR 574. The SUV didn't stop and continued eastbound on SR 574, according to police. A warrant has been obtained for Doris Suleyma Rosales-Carbajal, 27. She is charged with leaving the scene of a crash without rendering aid involving death, leaving the scene of a crash without rendering aid involving serious bodily injury, no valid driver's license and tampering with evidence. Shortly after the crash, Rosales-Carbajal is believed to have fled to Mexico, where she is believed to currently still be located. According to a search warrant obtained by ABC Action News, the witness who came forward to tell police about Rosales-Carbajal's actions also indicated that she had her mother, sister and two children in the car at the time of the hit-and-run. Hernandez died at the scene and the other two men sustained non-life threatening injuries and were sent to a local hospital for treatment. It is unknown if the men were walking on the roadway shoulder or on the sidewalk at the time of the incident. Police said the suspected vehicle is possibly a GM SUV in the 2007 to 2014 model year range. The vehicle may be a Cadillac Escalade SUV, Chevy Tahoe or GMC Yukon. The color of the vehicle is pearl white metallic. Police say the damaged areas of the vehicle include the headlights amber colored turn signal lenses and rear view mirrors.